The Roman Forum was once the center of ancient Rome. Today it constitutes the most extensive area of ruins and evidences of the glorious past of Rome. The remains of the Roman Forum are located between Palatine Hill and Capitoline Hill in Rome. Called, Forum Magnum in the golden years or just a Forum, it was the center around which ancient Rome has evolved, flourished and become the glorious majestic city. The Forum in Rome was a busy center of trade, religion, prostitution and judiciary. This oldest part of present day Rome has accommodated the most important structures of the ancient city. According to historical texts from an unknown adventurer from the 8th century, one tells of the time that the forum was already crumbling. In medieval times The Roman Forum was totally neglected. Buildings or what was left of them were buried under the debris. The place was known as, Campo Vaccino or translated, pasture for livestock, which was located between the Capitol and the Colosseum. The rise of the Colosseum in Rome began with the return of Pope Urban V from Avignon in 1367. After that time the ancient ruins became a big interest for artists and painters, by the end of the 15th century artists had already drawn the ruins of the Roman Forum. The onset of the excavations and archaeological studies were in the Roman center and began in the late 18th century. By early 20th century, it was completely uncovered and open for free visits. The initial work was done by Carlo Fea, who in 1803 began cleaning up the debris around the Arch of Septimius Severus, which was the first step towards the full opening of the Forum. 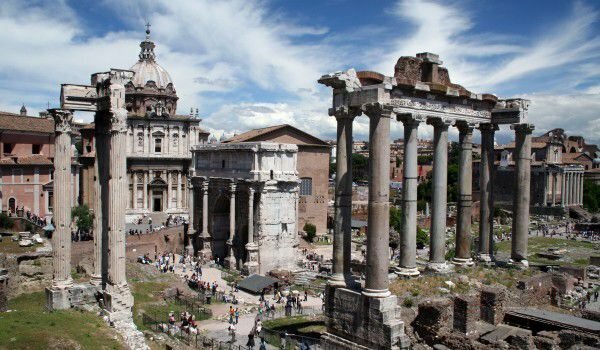 Visitors today can see in the Roman Forum the ruins and remains of several centuries because of the practice of the Romans to erect new buildings on old buildings. When you look at the Roman Forum with Palatine Hill in the background, you will see the left arch, which is the Arch of Septimius Severus, which is made of white marble and was built in 204 in honor of the war with the Parthians and the emperor, Septimius Severus and his sons, Caracalla and Geta. To the right of it are the three columns of the Temple of Vespasian and Titus, which are located in front of the Temple of Saturn. This temple in the Roman Forum was built in honor of the god Saturn about 489 BC. Today they have managed to save only a few columns in the Ionic order. The Temple of Saturn has several times been burned, but in 42 BC was re-built after the fire during the reign of Karin in 283 AD. The inscription on the frieze confirms that: Senatus populusque romanus incendio consumptum restituit - The Senate and people of Rome destroyed by the fire is restored. The Temple of Romulus is part of the Basilica of St. Cosmas and Damian, devoted to two Greek brothers. It is located in the Forum of Vespasian, known as the Forum of Peace. Temple of Venus and Roma, locally known as, Templum Veneris et Romae, was the largest known Roman temple in Ancient Rome. Situated on the eastern side of the Roman Forum, close to the Coliseum. This part of the Roman Forum is dedicated to the goddesses Venus and Roma Aeterna. The temple was built by the Roman emperor Hadrian, and construction began in 121 and graduated in 141 during the reign of Antoninus Pius. In 307, it was partially burned but was rebuilt by Emperor Maxentius.